"Eastern red columbine is very similar in appearance to the Western red columbine. This native perennial can grow up to two feet tall and produces showy bell-shaped flowers of red and yellow. At home in any woodland setting and can tolerate more shade than many other types of wildflowers. Like other columbines, Eastern red columbine attracts a variety pollinators such as hummingbirds, bees, butterflies, and moths. Scientific Name: Aquilegia canadensis "
Eastern red columbine is very similar in appearance to the Western red columbine. This native perennial can grow up to two feet tall and produces showy bell-shaped flowers of red and yellow. At home in any woodland setting and can tolerate more shade than many other types of wildflowers. 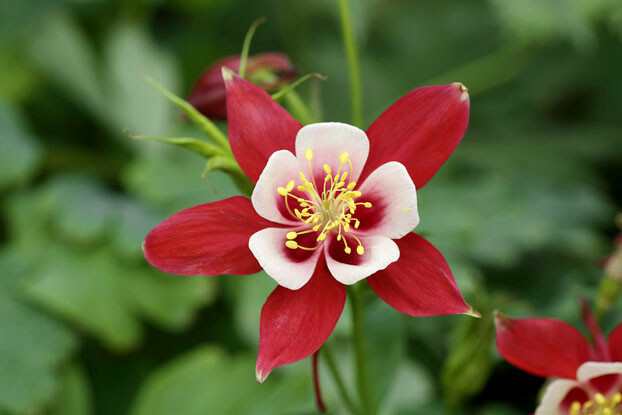 Like other columbines, Eastern red columbine attracts a variety pollinators such as hummingbirds, bees, butterflies, and moths.